WASHINGTON, DC -- Both NATO and the United States have publicly acknowledged that Russia is violating the newest cease-fire over Ukraine, which was recently concluded in Minsk, Belarus. 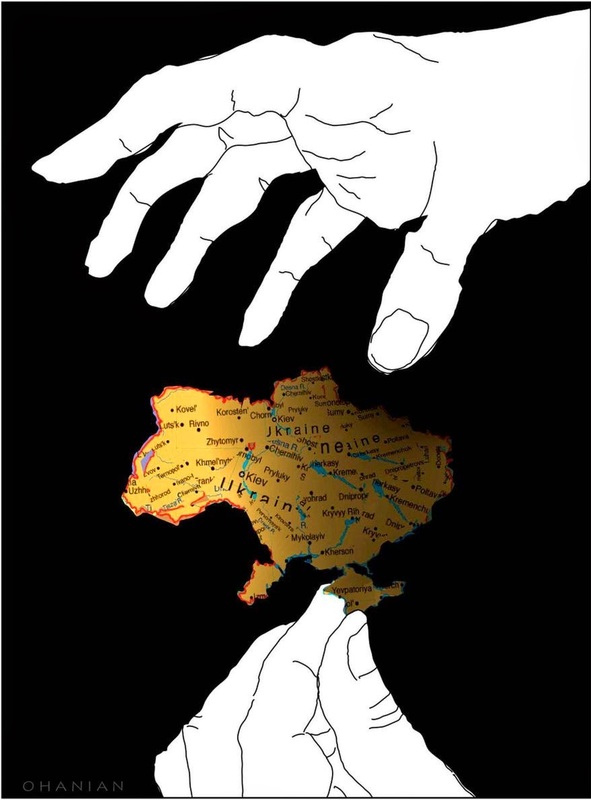 Illustration on Putin's renewed aggression against Ukraine. Despite the agreement, Moscow is still sending tanks, armored vehicles, rocket technology and artillery to separatist elements inside Ukraine, and has moved on to occupy the strategically located railroad terminal of Debaltseve. Moscow’s continuing military buildup in the Donbass region, and the outbreak of renewed fighting, strongly suggests that Russia does not seek an off-ramp out of Ukraine but intends to conquer still more Ukrainian territory. Many fear that Russia may next move on the southeastern Ukrainian city of Mariupol, in order to cut Ukraine off from the Crimean coast and continue building President Vladimir Putin’s so-called “New Russia” project. Doing so would put Russia within reach of a “land bridge” from Crimea to Transdniester, the Russian-dominated enclave it cut out of Moldova in 1992. Attaining that objective would cripple any Ukrainian state to an almost unimaginable degree. However, there is good reason to believe that Russia’s main target for what promises to be a spring offensive is actually Ukraine’s “second city,” Kharkiv, a major defense industrial center. Seizing Kharkiv would also represent another bite out of Ukraine’s shrunken territory and a demonstration to the West of just how much Moscow scoffs at its weakness and how little regard it has for the agreements it signs with third parties. A major buildup is currently taking place in vicinity of the Russian cities of Belgorod and Voronezh, just over the border from Kharkiv, whose defense industries present an attractive target, especially since the city appears to be less well defended than Mariupol. Likewise, Moscow has essentially mobilized its entire Western border in snap exercises recently. Russia has long used exercises as a springboard for offensive operations (as it did against Georgia in 2008), and these exercises could well serve as the basis for a new offensive. Under the circumstances, it remains a mystery why the United States and its allies still cling to hopes of Russian goodwill, and continue to seek diplomatic “off-ramps” for Putin. By now, it should be abundantly clear that Russia’s president is not interested in giving diplomacy a chance. Instead, he has shown abiding contempt for diplomacy, and a wanton disregard of the maxim that agreements must be kept. Given this outlook, Western inaction has only emboldened further escalation from Moscow. If that realization is not enough to compel the West to act, consider this. Putin cannot simply keep escalating his forces against Ukraine ad infinitum. In fact, Russia may have already reached the culminating point of its offensives. It is already having difficulties sustaining its manpower in the country, as NATO has observed. The problem has become so acute for Moscow that it is actually emptying out its jails to recruit Chechen thugs and others with the promise of paid freedom if they enlist and serve in Ukraine. Troops are reportedly being recruited from Buryatiya, Central Asia, and Siberia so that Russians do not have to fight Ukrainians. Nor can the Russian defense industry simply churn out weapons for use in the conflict because that industry is having trouble getting the materials it needs due to Western sanctions. Add to this the fact that Western capabilities, if backed by resolute political will, far outpace Russian capabilities, and you have a compelling case for the United States and Europe to do far more than they have to date to aid Ukraine and to regain control of the escalation process. So far, however, they have not. The United States and its allies have been delinquent in providing Ukraine with the weapons and training it needs and deserves. The reasons relate to both apathy and fear. On the one hand, too many officials in both Washington and European capitals do not care enough about Ukraine to supply even the full spectrum of non-lethal aid that Kiev desperately needs. On the other, too many statesmen fear Putin’s resoluteness and political will. Russia’s president possesses both in abundance. This is why — despite a preponderance of strength and capability — the West has found itself on the defensive in the face of the Kremlin’s onslaught. It is also why we can expect Russia to move on to its next objective in Ukraine in the not-too-distant future.